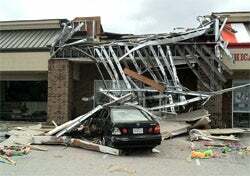 How a Business Emergency Plan Paid Off in Tornado-Struck Joplin, Mo. Being prepared for a disaster -- natural or otherwise -- isn't just smart, it's good business. On a Sunday afternoon in May, Meagan Snider and a co-worker at Freddy's Frozen Custard & Steakburgers were cleaning the oil out of the fryer when the hail started to fall. The wind began to blow so hard that it rattled the satellite dish on the roof. The reception on the TV in the restaurant blurred, but people watched on. The staffers even joked about the reception while intermittently running outside to see who could find the biggest piece of hail. "That kind of weather is common in Joplin," says Snider, the Freddy's manager on duty that day. "Storms always go around us and we just get the tail end." But when the reception fizzled completely, she realized that this storm was different. The guests in the store's dining room turned to their smart phones to check the Internet. One of the customers said it was a tornado. Snider's boyfriend called and confirmed that a tornado was indeed on its way -- and that he could see it. He lived five minutes from the store. Quickly, she rounded up the roughly 15 customers in the Freddy's and eight employees -- asking everyone to take cover in the bathrooms, which were the only rooms in the building without windows. A family who had been turned away from another local business also took shelter in the restrooms. They heard the loud cracks of falling trees, crunching cars and howling winds. After an excruciating three-and-a-half minute wait, the noise had passed and Snider peered out of the bathroom to survey the conditions. At the Joplin, Mo., Freddy's the roof caved in, windows burst and a wall from a nearby store whipped through the dining room. "I opened the doors and I thought the whole town was gone," says Snider. The cars in the parking lot had disappeared, the windows were blown in and the store's roof had been ripped off in one section. "I was so heart broken," she adds. "I didn't know how to prepare anyone for what they were going to see. My jaw just dropped." That day, Joplin got slammed by a storm that meteorologists call an EF5 multiple-vortex tornado, which is the strongest kind of tornado there is. Leaving little intact in its wake, the tornado claimed 162 lives and more than 8,000 homes and businesses. The Missouri Department of Insurance says insurance payouts could reach $2 billion. The cost to rebuild the Freddy's store and replace damaged equipment will run roughly $750,000. Though the toll at Freddy's in Joplin was considerable, things could have been much worse. 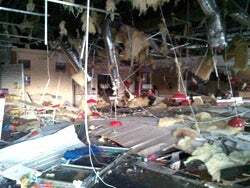 Fortunately, the store's owner Jason Ingermason took steps to prepare the business for emergency situations, and the staffers moved quickly to follow the store's disaster plan. Ingermason now plans to re-open his store by the middle of 2012. Have a disaster plan. Ingermason had created a disaster-prep list, adapting it from an overview of emergency procedures from the Freddy's franchising company. While the overview suggests customers and employees head to the store's walk-in refrigerator to take cover in the event of disaster, the Joplin Freddy's freezers were outside of the restaurant, so the plan called for directing people to a windowless room as Snider did. Other steps like turning off dangerous equipment, which could catch fire or explode, were on Ingermason's disaster-prep list and were followed. Train employees on the plan. Ingermason reviews his store's disaster plan quarterly with the company's managers who are then required to train employees. "We do preparation in our manager meetings and you hope that when a disaster like this happens, that thought process kicks in," says Ingermason. "You hope that enough people will be calm and collected." House important documents safely, offsite. And if disaster does strike, you'll be glad if you have a backup system that houses important financial statements and other documents necessary to file an insurance claim. Ingermason says he keeps many of the documents he needed at his office in Salina, Kan., and backed up on servers that are housed elsewhere. But some things like the store's inventory records that were housed on site were lost. Get insurance coverage for business interruptions. Insurance costs can be considerable -- especially when you tack on separate coverage to protect your business against earthquakes, fire and floods. But for business owners like Ingermason -- who is expecting his rebuilding effort to cost roughly $750,000 -- having proper insurance coverage is vital. Specifically, Ingermason has what's known as a business umbrella policy with business interruption insurance, which costs him more than $5,000 a year for the Joplin store. The policy covers liability issues like someone falling on his company's property -- along with the cost of rebuilding construction, furniture and fixtures, all of the store's equipment, retraining employees and reopening expenses. Ingermason's policy also covers certain daily operational expenses that are incurred even though the business is no longer open, he adds. Plan for employees. Not only is Ingermason's insurance policy helping him rebuild, it provides income replacement for him and his staffers. The policy he has provides replacement income for up to 12 months. "Some believe that's a big expense, but when the worst happens, it's nice to have a plan not only for your own success and longevity but for employees as well," says Ingermason. In addition to receiving back pay, some of the store's employees are able to work at Ingermason's store in Pittsburg, Mo., which is about 40 minutes from the Joplin location. "We've got about five or six who are commuting right now. We're trying to compensate their fuel expenses, too," he says.